It's an old story. The kids find a lost animal. It's cute, it's needy, but one parent says "No way. No how. No pet today." And the other parent points out the poor animal's plight. In front of a big-eyed kid or two or three, what parent wants to look like an inhumane ogre? "You're right again," Mom said to Dad. And how a car might squash her flat. 'Slim chance to none' is what she's got"
And put up posters saying FOUND. Now kids, sit down and stop your yay-ing. This cat's NOT--you hear!--NOT STAYING!" "I don't like cats. They scratch my knees. They carry fleas. They make me sneeze. They eat my cheese. They hairball wheeze. They're always getting stuck in trees!" Sometimes a man has to put his foot down. Sometimes a man has to make a statement. Sometimes a man has to--get a dog! And that's what Dad does. All sad and lonely at the pound." ...Daddy is a doggy lover! 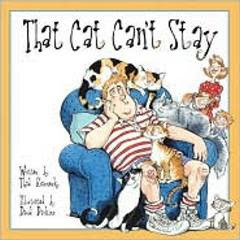 Thad Krasnesky's bouncy rhyming couplets and David Perkins' clever cartoon illustrations make That Cat Can't Stay (Flashlight Books, 2010) a pleasure to read aloud and to hear. Kids will giggle at Mom's clever guilt tripping of the bossy but soft-hearted dad and will quickly pick up on his plaintive refrain as each sad kitty's case is pleaded before him. Dog lovers, cat lovers, and even (horrors!) cat shunners will find something to laugh at in this one.